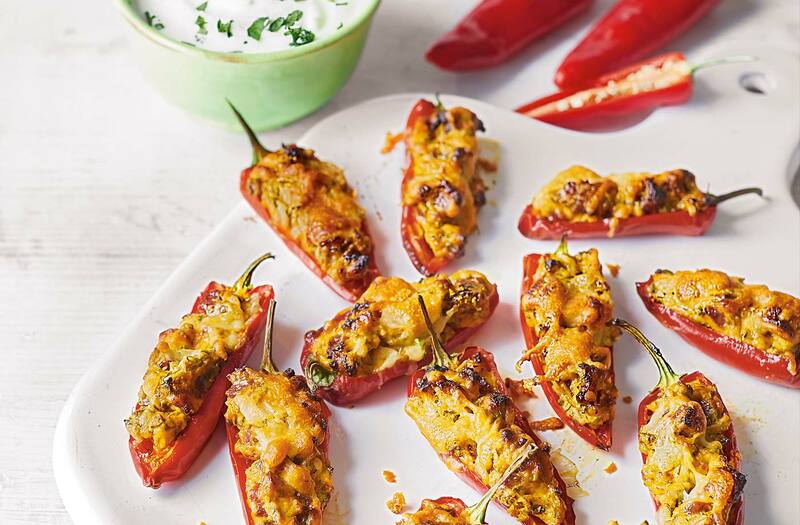 Try these spicy stuffed chillies for an easy snack idea. Filled with crisp chorizo and creamy soft cheese and paired with a cooling coriander dip, they're great for sharing with a crowd or serving as a simple starter. Preheat the oven to gas 5, 190°C, fan 170°C. Dry-fry the chorizo in a frying pan until it starts to crisp and release its oils. Leave to cool, then mix with the soft cheese, spring onion, lime zest and juice, the garlic and 2 tsp chopped coriander; season. Halve the chillies lengthways and carefully scoop out the seeds and membrane; discard. Arrange the chilli halves on a lightly oiled baking sheet and fill each with the chorizo cheese mix. Sprinkle over the Cheddar and bake for 20 mins, covering with foil for the final 5 mins to prevent them browning too much. Meanwhile, mix the dip ingredients in a small bowl, with a little seasoning. Serve the chillies garnished with the remaining coriander and the cooling dip on the side. Tip: Mellow the heat of the chillies by blanching them whole in a pan of boiling water for 2 mins, before halving and deseeding.